Fax Voip T38 Fax & Voice is a practical voice fax modem application that works with virtual Fax VOIP 14.4K TAPI Voice-Fax Modems and Fax VOIP Virtual COM ports. The program works as a SIP/H.323 client with G.711 and T.38 fax support. Fax Voip T38 Fax & Voice can be used to implement fax and voice mailbox into SIP, H.323 or ISDN networks. It supports using up to 100 virtual modems at the same time and provides call routing functions as well as multiple SIP registrations for a versatile and customizable system. It’s possible to send audio messages, T.38, audio, and CAPI faxes using the Fax Voip Virtual Printer. Furthermore, faxes can be received as TIFF, SFF, or PDF files and the Fax Voip Console can be used for managing audio messages and faxes. 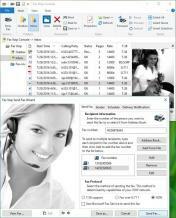 Incoming faxes to the recipients on the network can be routed via email, printed or stored in a folder. Also, callers can retrieve information via fax during the same call using the Fax on Demand function.